Uncategorized Archives - A Blog by D.W.
My name is David, and I’m a registered voter in Hamilton County, Tennessee, and I’m writing to urge you to vote NOT on the Better Care Reconciliation Act. I, and people I am extremely close to, would be directly and negatively impacted by this legislation. We have been sick – through no fault of our own. In 2004, I was diagnosed with Non-Hodgkins Lymphoma. That experience taught me a lot about the conventional American health care system. Concepts such as seeking a 2nd (or even a 3rd) opinion to a major diagnosis, maintaining a healthy diet, and making my own informed decisions (and not blindly following the advice of a doctor) are second nature to me now. I was originally misdiagnosed with a more aggressive form of lymphoma than the one I actually had, and narrowly avoided 2 years of chemotherapy and monthly hospitalizations with spinal taps. In reality, I only needed a small handful of treatments, which were finished 6 months after they started. Several years ago, my wife, Lauren, was diagnosed with Bipolar disorder. After two hospitalizations and spending years in counseling and taking toxic medication, Lauren decided to pursue alternative approaches to her health. Over the last two years, Lauren has maintained an incredibly strict nutrition plan which has done wonders. She is stable, has been off traditional medications for months, and feels better than she has felt in years. However, Bipolar is a chronic disease, and when all else fails, expensive medications can stabilize a patient. When needed, these medications are a good and necessary thing. Through no fault of her own, my wife has a chronic, life-long disease. A few years ago, my sister gave birth to a feisty girl named Annie. Unfortunately, as the doctors discovered at the 20-week pre-natal exam, the left side of Annie’s heart wasn’t growing. It was completely missing. Through no fault of her own, Annie was born with Hypoplastic Left Heart Syndrome. Through no fault of her own, Annie has a pre-existing condition and will need to take medications and monitor her pulse for her entire life. These illnesses are not our fault. Yet, according to the Congressional Budget Office, all of us might lose health insurance coverage if the Better Care Reconciliation Act becomes law. This bill claims to be “better” for the American people. While the ACA is not perfect and certainly needs to be modified, the BCRA is nothing of the sort that helps every day Americans. The BCRA is harmful to me, my wife, my niece, the disabled, the elderly, and the poor. In short, it is an assault on the lives and the health of all Americans. I urge you and your colleagues to vote NO. This entry was posted in Uncategorized on June 27, 2017 by David. My wife Lauren and I have been renting from her parents for the last year, and currently live in the house where she spent the majority of her teenage years. It’s been a good setup for us. They are giving us an incredible deal, which has allowed us to live in a part of town where Lauren feels safe. You see, Lauren was diagnosed with bipolar disorder several years ago, and the feeling of safety (and lack of triggers for paranoia) are a big deal for her. 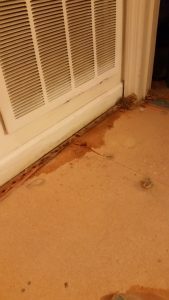 After pulling up the carpet, I found that portions of the original MDF particle board underneath were swollen from cat pee from long ago. It was horridly disgusting. Unfortunately, when Lauren’s family lived here, there was a cat. Who peed. A lot. I noticed the stench from day one, and it was awful. Before moving in, I rented a carpet cleaner from Home Depot, used a lot of baking soda, and did everything I could to clean the floors. That helped some, but the stench was still there. We had a heavy-duty air purifier going 24×7 which also helped, but it still wasn’t enough. I complained about it almost constantly, but it didn’t seem to bother Lauren. Until…. A few months ago, Lauren’s naturopath told us about the toxic effects that cat pee, in particular, can be to humans – and especially to babies crawling around. At the time, Lauren and I weren’t pregnant nor were we thinking about having kids in the immediate future, but this was a wake-up call, and we finally decided to talk to her parents about having the upstairs refloored. Without thinking about the work involved too much or the implications, Lauren and I offered for me to do the work. Huge mistake! As anyone who has done home renovations or remodeling projects knows, the amount of time that you think a project will take is never accurate – and the time commitment winds up being a lot more (and the project often times becomes a lot more complicated along the way). Just about anything that could go wrong, did go wrong. I had hardly any experience with this type of work either. As of this blog post, though, the project is nearing completion, I have had friends, my brother (who was once a general contractor), and Lauren’s dad help me on multiple occasions, and I’ve learned quite a bit about redoing floors (including floor joists and frames), drywall, tiling, and more. A section of the hall, where the cat peed on the wall. I took up some of the flooring too, to be sure I got it all. If cat pee smells even before you start to take up carpet, it’s going to be a lot worse once the carpet is up. Vinegar is supposed to help neutralize cat odor. If there’s a lot of pee, though, don’t waste your time. Tear all of the affected parts of the floor and drywall out. Nothing will get rid of the stench. No, really, tear everything out. ESPECIALLY if it got onto the drywall. You see, drywall can’t really get wet. If it does, it just absorbs the moisture (think: cat pee. And the integrity – strength, if you will – will decrease). Carpenters who originally put down MDF particle board on top of plywood should be defenestrated. They saved maybe a few cents per square feet – but that’s not the proper way to lay subfloor. Also, MDF particle board absorbs liquids too (and swells up. See points #2 and #3). Cats sometimes spray their pee vertically (supposedly to mark their territory). When this is done to drywall, over several years, it is disgusting. I now know how to replace drywall. 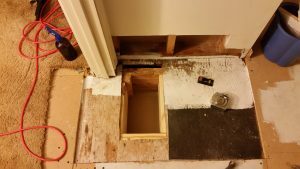 Do not, under any circumstance, cut out (or allow your friends with carpentry experience to cut out) the bathroom floor without actual evidence of a leak or other problem. 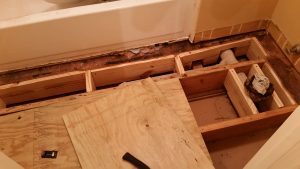 My friend, who meant well, cut out the floor of an entire bathroom, because he wanted to make sure that everything was “fine” underneath. It was. But that also added a significant amount of work to the project, as I had to install new floor joists along the edge of where the cuts were made, to support the new flooring that I would eventually put in. Last, but certainly not least: to be able to live in a house without the smell of cat pee is a wonderful thing indeed. Bonus: Don’t volunteer to refloor a house that you don’t own without fully knowing what you’re getting into. (Special thanks, though, to my father-in-law who has come out several weekends to help me on this project, and who temporarily reduced my rent to help account for all of the time I was spending on the project). New floor joists that I installed into the bathroom. Interestingly, there were not supports originally underneath the toilet. I put some in! As annoying as this project has been, and as much work as I’ve put into this project without a whole lot in return, I can safely say that I am a much more experienced carpenter now, and many of the skills that I self-taught myself along the way will be invaluable to me for the rest of my life. This entry was posted in Uncategorized on May 30, 2017 by David.